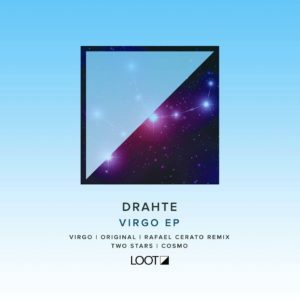 The emotional, cosmic sound of Drahte makes its debut on Loot Recordings with a four track EP of deep, melodic techno that includes a powerhouse remix by Rafael Cerato. Drahte are an electronic duo based in Naples who don’t say much, but instead like to offer you a trip in a musical form. Their infectious, deep, beautiful sound is from the heart and makes an emotional impact. The title track “Virgo” is a dramatic and rolling tech cut with heavy drums. The synth work adds a sombre vibe and the chords gently roll up and down the scale, hooking you from the start. The Rafael Cerato remix is a stripped down version and takes on a more driving and deep vibe. Lovely wooden hits help power things along, as do some muffled vocals, but it’s the emotive strings and moody synth leads that own the show here. “Two Stars” is a turbulent track with edgy chords that pan throughout the track, with heavy drums, crisp claps and a real melodic arrangement that adds to the dynamism of the track. Closing the EP is “Cosmo” that’s atmospheric and deep, sprinkled with spaced out keys, chaotic chords and intriguing breakdowns.